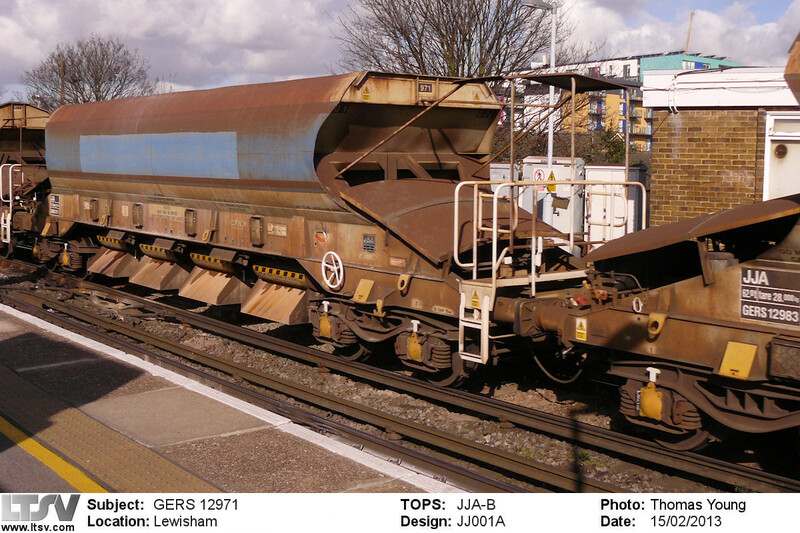 Summary: Wagon hirer Tiphook bought 150 bogie hoppers in the late 1980s for spot-hires in various traffics. Within a few years most were stored out of use and one was modified as a ballast hopper with a view to replacing railway-owned types such as the Walrus and Sealion. The conversion, dubbed Autoballaster, was evidently a success and further batches accounted for the majority of the stored wagons. There was then a programme of building new Autoballasters with an order for 190 wagons followed by further batches of 50 and 10. History: Tiphook was a new name on the UK freight scene in the late 1980s and they ordered several large batches of bogie wagons, all of which were numbered in the RIV series. 50 hoppers were built by Arbel Fauvet of France in summer 1988, numbered 83.70.6905.000 to 049 and coded PIA (PIA-X to design code PIE700). The design featured a curved-sided hopper mounted quite high above the bogies, this being so that unloading equipment such as conveyor belts could be positioned beneath the hopper doors. The livery was pale grey with blue underframe and bogies, and the Tiphook Rail logo and lettering was carried prominently on the hopper sides. A second batch of 100 wagons followed from late 1989, these being similar but to design code PIE702 and numbered 83.70.6905.100 to 199. PIA 83.70.6905.129-5 in as-built condition at the Railfreight 89 exhibition at Cricklewood depot. Most of the first batch was hired to Foster Yeoman for use on aggregates duties, while the second batch was first used by ECC Quarries for services from Croft. The TOPS code changes of 1990 saw the type recoded as KPA (KPA-X), with the design codes being re-prefixed accordingly. The examples used by ECC Quarries were replaced by a new build of JRAs from late-1990, these being numbered as 33.70.6905.050 to 073 (ie in between the two Tiphook batches). Although a few other short-term hires were placed (either for single wagons or complete rakes), the type was far from fully employed. In September 1992 the type was trialled on coal traffic, two wagons being modified with vibrators to assist discharge. During the tests, the two wagons were added to a rake of HAA coal hoppers, and used on services between Harworth Colliery and Thorpe Marsh Power Station. Seven other wagons were used for unloading tests. Although capable of carrying more payload, the limitations on overall train length meant that the bogie hoppers had little advantage over existing types. National Power (who had run the coal trials) later used 22 KPAs on limestone traffic between Tunstead and Drax, pending delivery of their own JHA wagons. Also carrying limestone from Tunstead were 25 KPAs hired to Buxton Lime Industries. These had their ends modified to reduce the overall height, affected wagons being given new design code KPE801. Although a batch of new JGA was delivered for this traffic in late 1994, a number of KPAs remained on hire. The original exchange code of 83 indicated wagons that were only permitted to operate to the continent under special arrangements. By the mid-1990s the code on many of the KPAs was changed to 33, presumably in connection with a relaxing of this restriction. Later on, some KPAs were used in France. During 1995, KPA number 83.70.6905.048 was modified as a ballast hopper. The four existing discharge chutes were extended and split to allow unloading to either side of the track. Each chute had a gate fitted, these being remotely controlled to enable precision positioning of ballast. The wagon was repainted in dark blue livery, had its end access platform and ladder removed, and the original door actuator holes in the upper solebars were plated over. It retained its KPA TOPS code but with new design code KPE833 and was sent on a nationwide demonstration tour, together with a pair of other Tiphook wagons. The conversion was known as an Autoballaster and a further 9 were produced in about 1997. The additional wagons were all from the second batch and were given new design code KPE839. They differed from the prototype in being fitted with large lights beneath the solebars for use during nighttime unloading. To provide power to the 10-wagon set, one of the ill-fated �Piggy-back� KOA intermodal wagons was modified with a generator and compressor. The Autoballasters later gained large GTRM branding on the hopper sides. Although there were signs of an upturn in work, 36 KPAs were withdrawn and scrapped in 1997. 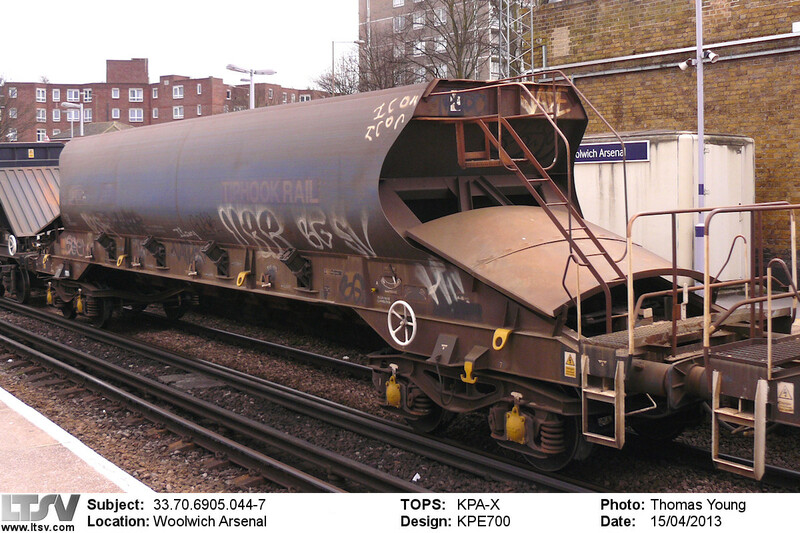 The bogies were later re-used on new build KQA �pocket� container wagons. Most of the remaining wagons were overhauled and repainted in the new dark blue livery, although many of these were to remain unused for some time. 15 KPAs were hired to RMC in 1998, while Marcon also used some wagons between Cliffe and Battersea. By 2000, just 45 of the 113 KPAs then in stock were in regular use. In 2000, a further 10 Autoballaster conversions were undertaken by Wabtec at Doncaster. There is a suggestion that these were originally renumbered as 83.70.6912.900 to 909 but they emerged with new numbers in the domestic, private-owner series as GERS12901 to 12910. 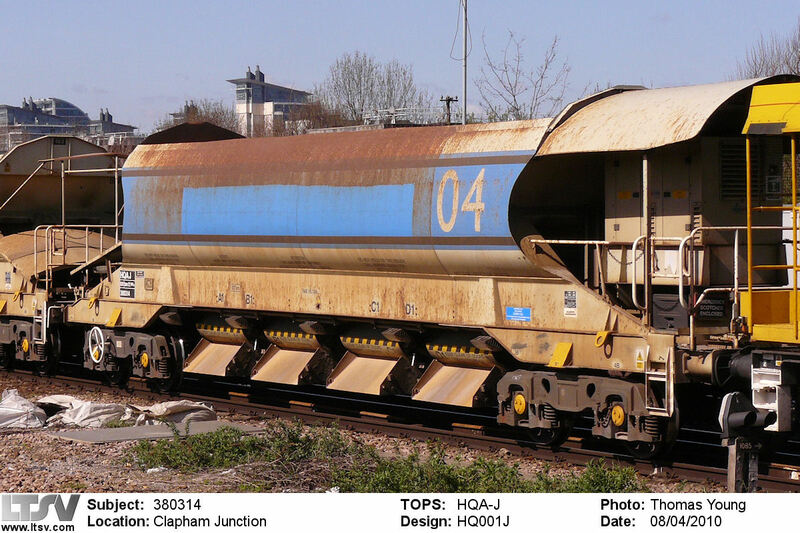 A new TOPS code of JJA (JJA-B) was applied and the wagons were to design code JJ001A apart from GERS12901 and 12910, which were JJ001B due to their being fitted with generators. The generator was fitted on the platform at one end of the wagon, with a canopy to the same profile as the hopper body. Livery was cream with thin red bands at the top and bottom of the hopper sides. 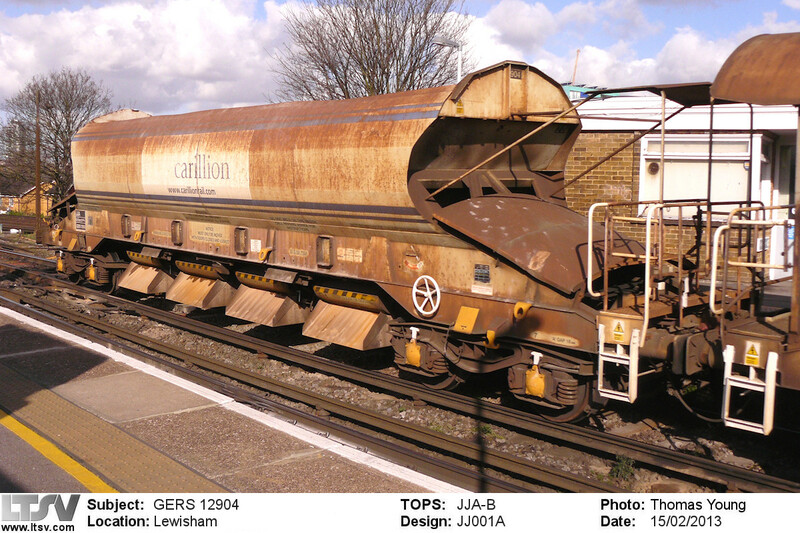 Initially carrying GTRM logos, these were replaced by large Carillion labels (and blue stripes) within a couple of years. JJA GERS12904 was one of the second set of Autoballaster conversions and still retained Carillion livery when seen at Lewisham in February 2013. It was rebuilt from 33.70.6905.196-5. The Autoballaster concept was obviously a success as an order for 350 wagons had already been placed in 1999. This total included 110 conversions and 190 new-build wagons. Following from the two 10-wagon sets already in use, work on the remaining 90 conversions started in late 2000, again at Wabtec. The source wagons were from both build batches, and included many that had cut-down ends (these being retained). The numbering followed the earlier JJAs at GERS12911 but the livery was changed to be cream with a broad blue band with brown stripes near the top and bottom. Large Railtrack lettering was applied to the blue hopper sides. By April 2001, wagons up to GERS12970 had been completed. One in every five wagons was fitted with a generator as a JJ001B (the remainder being JJ001A) and these were rather neatly delivered to be the wagons with numbers ending in a 5 or 6. The prototype set was called to works in 2001 and modified to the new standard. These slotted in to the main delivery sequence and were given new numbers GERS12990, GER12992 to 12999 and GERS13001. It would appear that the number 13000 was not used, although there is no evidence of this having been previously used. There seems to have been a change of plan regarding the total number of conversions undertaken, perhaps as a result of some source wagons being found to be unusable. In the event, the batch was completed with the delivery of GERS13002 to 13005 in summer 2001, to give a total of 104. It is reported that GERS13002 to 13004 were sent to Germany in 2001, but the purpose of this (and any associated renumbering) is not known. A curious development was the renumbering of GERS13001-13005 to GERS12895-12899 in 2010. This may have been to free-up the 13xxx series for other planned uses, or simply to group the Autoballasters in the 12xxx series. JJA GERS12971 was a production batch conversion (from 33.70.6905.111-4) and was one of several to have had the ends cut flat earlier on. The Railtrack lettering has been painted out but the wagon was in need of a full repaint when seen at Lewisham in February 2013. 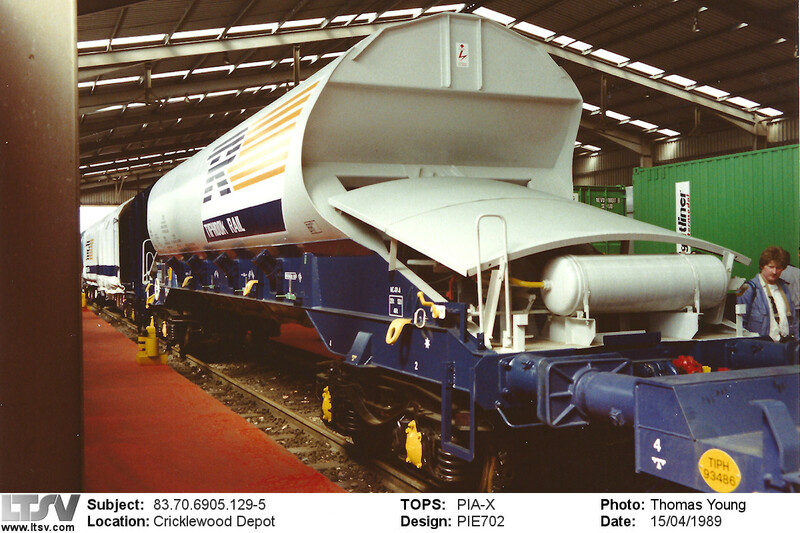 Delivery of the new-build wagons commenced in mid-2001 and they were very similar in appearance to the JJA conversions. The main differences were the fitting of Axle-Motion III bogies in place of Y25s, and smoother upper solebars without the door actuator holes. The wagons also had buckeye couplings within each 5-wagon set, buffers only being fitted at the outer ends. The inner wagons had modified discharge chutes, with a fold-over flap to extend their reach. The new wagons were numbered in the railway-owned series and given TOPS code HQA. The outer wagons without generators were numbered 380001 to 380038 and coded HQA-A (HQ001A), the inner wagons were 380101 to 380214 (HQA-C to HQ001C) and the outer wagons with generators were 380301 to 380338 (HQA-B to HQ001B). It is possible that published sources have transposed the HQA-B and HQA-C series as a photo of 380311 when newly into service shows it to be labelled HQA-C. This would make sense as the later builds were coded in order of outer, inner, outer. It is also worth mentioning that these wagons were among the first to display their full 4-letter TOPS codes. The livery of the first batch of HQAs was identical to that of the JJAs, complete with Railtrack lettering. Most of the batch was initially allocated to Channel Tunnel Rail Link construction work, and some of the wagons had large, two-digit set numbers painted on the sides of the end wagons. The numbering of wagons within each set is not to any fixed pattern (for example, the three inner wagons are not consecutive) although it is not known if they were delivered this way or subsequently re-formed. 380314 is a generator-fitted HQA-B from the first new-build batch (note the different bogies, smoother solebars and absence of buffers at the inner end). When seen at Clapham Junction in April 2010, the Railtrack lettering had again been painted-out but the large set number (now defunct) was still present. A second batch of 50 HQAs was built at Wabtec, Doncaster in late 2003. Formed into 10 sets, these wagons carried a very different livery of all-over yellow with large Network Rail logos, but were otherwise similar to the earlier HQAs. The outer wagons with generators were numbered 380401 to 380410 (HQA-F to HQ001F), the outer wagons without generators were 380501 to 380510 (HQA-D to HQ001D) and the inners were 380601 to 380630 (HQA-E to HQ001E). Starting in 2004, most of the first batch of HQAs were modified and recoded. It is not known what physical changes were made but all the HQA-A outers were recoded as HQA-G to HQ001G, the HQA-B outers (or perhaps Cs � see above) became HQA-Js to HQ001J, and the HQA-C inners became HQA-Hs to HQ001H. The final build of Autoballasters was a batch of 10 ordered in 2006 by GB Railfreight for use on their newly awarded Metronet track renewal contract. These were delivered in October that year and comprised wagons 380701 to 380710. Generators were fitted to outer wagons 380701 and 380706 (HQA-K to HQ003A), the inner wagons were 380702 to 380704 and 380707 to 380709 (HQA-L to HQ003B), while the other outers were 380705 and 380710 (HQA-M to HQ003C). Although capable of operating as two 5-wagon sets, the wagons have always worked as a 10-wagon rake. Livery was again all-over yellow, but with Metronet, GB Railfreight and London Underground logos, and a �Metronet. Renewing the Tube� slogan. Nominally based at Wellingborough but often to be seen parked at Wembley, the wagons are used during work on the open-air sections of the Metropolitan and District lines of London Underground. Nine KPAs remained on TOPS in 2008 though had reportedly been confined to the continent for some years. 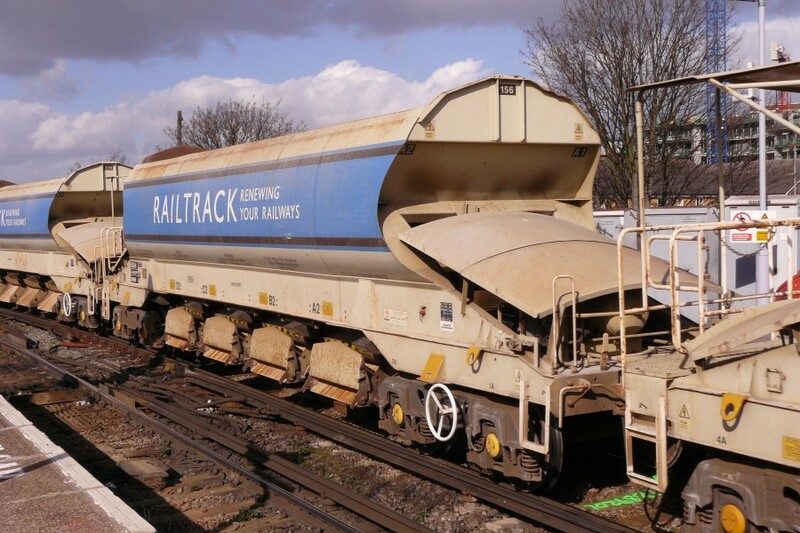 They returned to the UK that autumn and found use bolstering the JHA/HLA fleet on Marcon gravel trains from the Angerstein Wharf terminal in London. KPA 33.70.6905.044-7 is one of the 9 KPAs remaining in use in virtually original condition. Although most are still listed as being to original design code KPE700, all the survivors feature the cut-down ends that were covered by revised code KPE801. Photographed at Woolwich Arsenal in April 2013, working out of Angerstein Wharf with the new-build HLAs. Updates: 01/05/2013: Text updated (renumbering of JJAs) and larger photos added. HQAH 380156 at Lewisham, 26th February 2008.